Tucker Carlson Attacks "Cowards" Who Won't Defend Alex Jones: The Left Crushes Anything It Can't Control - Joe.My.God. 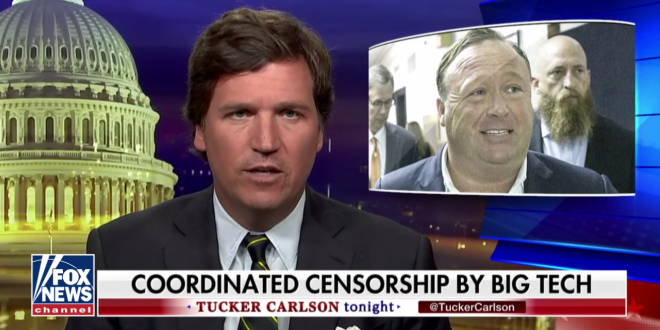 “As you probably heard, recently, many of the biggest tech companies joined in a coordinated effort to censor content from broadcaster Alex Jones. Apple, Facebook, Spotify, Vimeo, YouTube, Twitter, all of them pulled or froze Jones’ accounts on the grounds that his views are too dangerous to be heard publicly. The left, which seeks to crush anything it can’t control, applauded the news. The institutional right in Washington, afraid of being criticized, mostly stayed silent. That was foolish, and it was cowardly. “This isn’t about Alex Jones or any one person. It’s about the central principle of our society, and it’s at stake here. Do people have a right to communicate their views? It doesn’t matter what those views are, Alex Jones’ views or anyone else’s views. They may be misguided, they may be repugnant. Often, they are. But there is a remedy for repugnant views, make a counter-case. Defeat bad ideas with good ideas. “In totalitarian societies, only the powerful can be heard. The left used to understand that. Why are the most powerful companies in the world suddenly so threatened by an independent radio show host in Texas, that they are willing to lose business in order to make him shut up?” – Tucker Carlson, on last night’s show.